In this lesson, we will learn how to write expressions of the form a+a or a+a+1 to prove whether a number up to 20 is even or odd. Is the answer to the following sum odd or even: 6 + 6 + 1 ? Let us think about even numbers. 2, 4, 6, 8, and 10 are examples of even numbers. Notice that they are all doubles. Which of the following sums has an answer that is an even number? Shady brought 12 cupcakes to a party and Mariam brought 7 cupcakes. At the end of the party, there were 5 cupcakes left. Is the number of cupcakes that were eaten even or odd? State whether the answer to the sum is even or odd: 7 + 7 . Sherif has drawn this picture to show that 16 is an even number. His teacher asks him to complete the addition sentence that shows that 16 is even. He knows that he needs to write the same number in both boxes. What number is this? Mariam has drawn this picture to show that 17 is an odd number. Her teacher asks her to complete the addition sentence that shows that 17 is odd. She knows that she needs to write the same number in both boxes. What number is this? If a number is odd, then we can divide it into two equal groups with one left over. 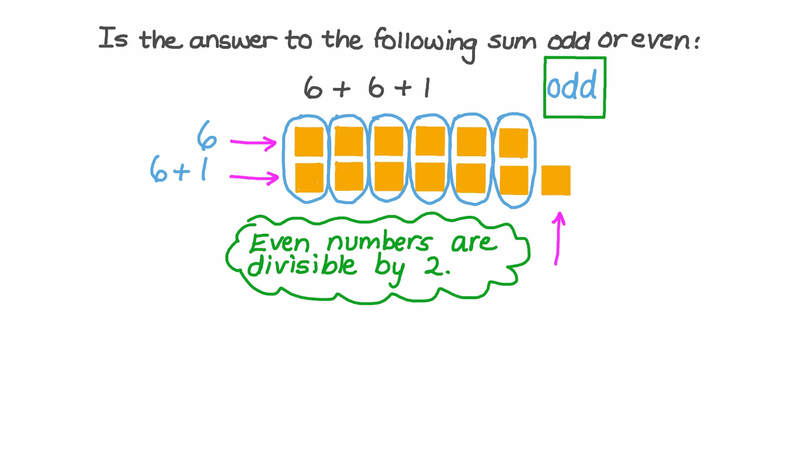 This means that every odd number can be written as an addition sentence that is a doubles fact plus one. For example, we know that 11 is odd because 1 1 = 5 + 5 + 1 . Which of these addition sentences shows that 9 is odd? If a number is even, then we can divide it into two equal groups. This means that every even number can be written as a doubles addition sentence. For example, we know that 10 is even because 1 0 = 5 + 5 . Which of these addition sentences shows that 12 is even? An even number plus an odd number is . An odd number plus an odd number is . An even number plus is an odd number.